Happy Monday! Anyone else sad that the Winter Olympics are over? Last night I thought to myself... "what on earth am I going to do in class now?" Hah, I promise I'm actually an awesome student. But in all seriousness, I'm SO proud of the Canadian athletes and their performances at the games. There's no better time to show off Canadian pride! 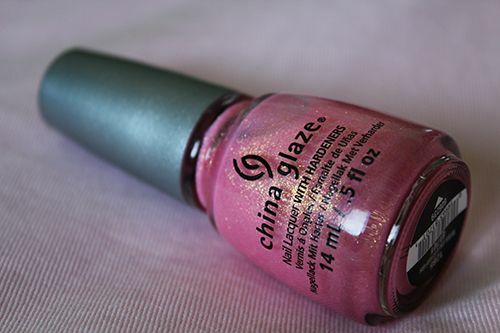 To kick off this week, I have one of the newest shades from China Glaze to share with you today. It made it's first appearance in my Valentine's Day inspired mani, but I wanted to show it off on its own. 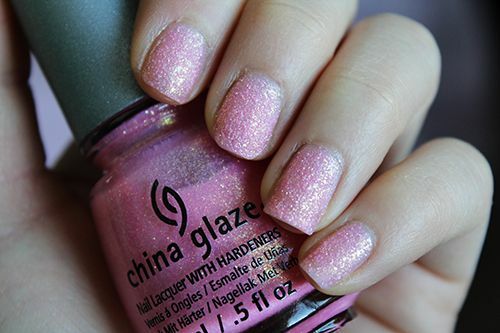 Wish on a Starfish is one of six shades from the China Glaze Sea Goddess collection for Spring 2014. I would categorize all six as pretty Spring shades, but what is unique about them is the fact that they are all textured polishes. This was something difficult for me to get used to as I love my nail polishes to dry smooth and flat. To me, Wish on a Starfish is a pretty bubblegum pink base loaded with small gold glitter and a textured filler. 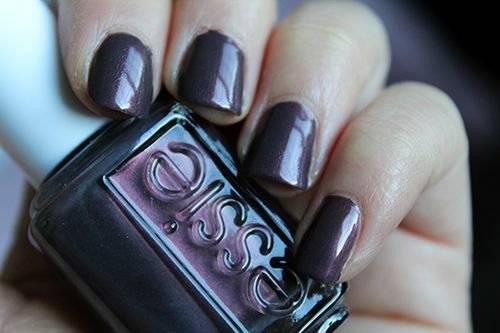 After the application of two coats, the polish dries sparkly and attains a texture similar to that of sand. 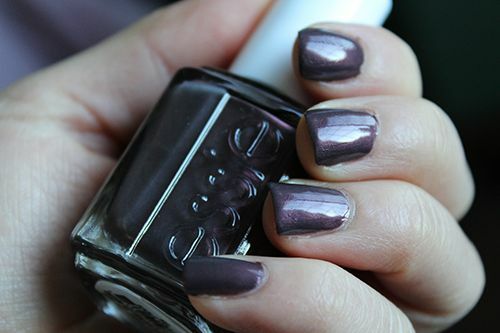 I thought that the addition of a top coat may reduce the textured effect, but it actually didn't change anything and felt like the polish just completely absorbed my top coat. It's a little strange to have a finished manicure feel bumpy and rough, but it allows for an ultra sparkly finish and a long lasting manicure. I got five full days of wear with two coats, and when the polish starts to chip you hardly notice it as the sparkles fill in the gaps. 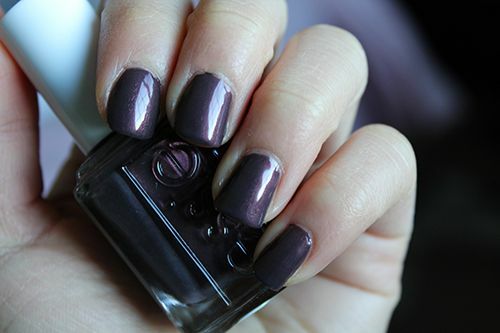 It will be a great colour for the upcoming warm-weather months and available via Nail Polish Canada if you're interested. If I venture out to the north end of the city for food, it'd better be good. I've visited Lan's Asian Grill in the past, but as it is so far from where I live it's definitely a treat when I can go! Last week was the perfect opportunity to stop by for a quick lunch with a friend before the cheese-making opportunity at NAIT. When we arrived at 11:30 on a Thursday the lunch rush was just starting up and we were glad we didn't arrive any later. Located in a strip mall in an older part of the city, Lan's Asian Grill is always welcoming from the moment you step in through the door. Tables and chairs are scattered around the restaurant, while a large service counter at the front draws your eye to the open kitchen. The service style at Lan's is simple and straightforward: find your table and head up to the front counter to make & pay for your order, or vice versa, whatever you prefer. Having just released their menu on February 6th, I was excited to see what new dishes were available. At Lan's the philosophy is simple: by using only the freshest ingredients and traditional dishes as inspiration, you're bound to make tasty food. The new food menu features appetizers, six different main dishes, and one seasonal dish. At first glance it may seem as if there isn't much variety, but there are options for each dish to create endless possibilities, so something is bound to suit your tastes. 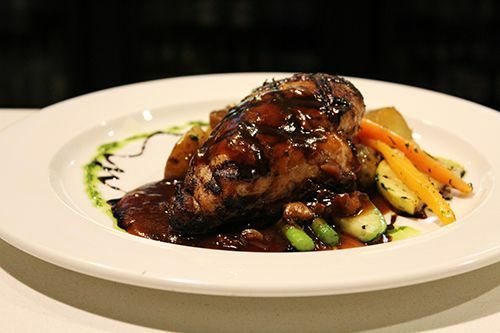 Whether you're vegetarian, gluten free, or picky about your food, you are able to customize your dish to your liking. One of the dishes we ordered was the Thai Basil Stir Fry & Jasmine Rice ($10), the feature of the month. 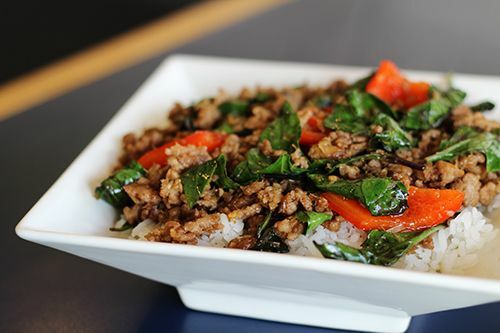 Thai basil, lemongrass, fresh thai chilies and bell peppers are stir fried with ground pork and laid on a bed of rice. A kick of heat from the chilis came through the sweet and savoury flavours while the bell peppers gave a nice crunch to contrast the soft textures of the meat and rice. It's an absolutely fragrant dish and I could sit and eat this forever. 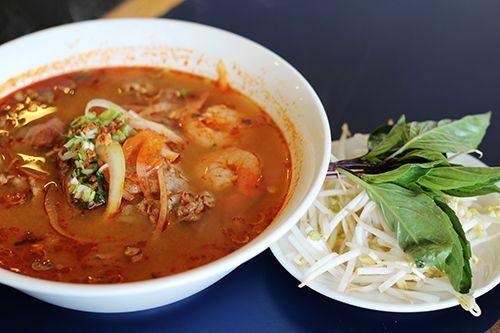 For myself I had to order the Tom Yum Pho ($12) made with beef, prawns, tomatoes, green onions, onions and cilantro. Rice noodles cooked al dente were waiting in the bowl of steaming broth, slowly absorbing the flavours of the fragrant herbs. The prawns were large and meaty, and there were plenty in the bowl to make this a filling meal. Make sure not to leave a drop of the soup behind - but knowing how delicious it is, I don't think you would anyway. Lan's Asian Grill really is a hidden gem in our city. Not every meal we eat has to be fancy or complex, and this restaurant is able to show that sometimes simple really is best. Don't overlook the restaurant based on the area in which it's located! The food is affordable and you definitely know that you get your money's worth after your first bite. Who loves fresh cheese? Who's made fresh cheese? I for one have, and it really is a fun and satisfying activity to carry out in the kitchen. The Northern Alberta Institute of Technology (NAIT) has recently launched its own line of cheese and last week I had the opportunity to stop by the campus to learn more about their new cheese-making initiative. 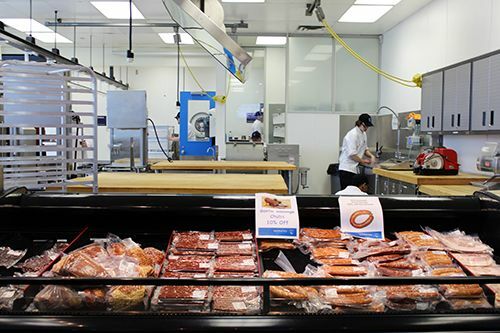 The Culinary Arts program at NAIT is now teaching students how to make artisanal cheeses from scratch and selling the product in their Retail Meat Store on campus. 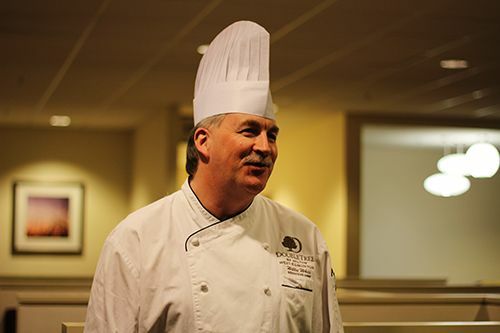 Currently, a selection of brie, feta and mozzarella is available for purchase, and many of the cheeses made on campus are featured in dishes cooked by the students at Ernest's, NAIT's fine dining restaurant. In partnership with Alberta Milk and the Alberta Livestock and Meat Agency, NAIT has purchased a 200 litre cheese vat for its cheese lab. 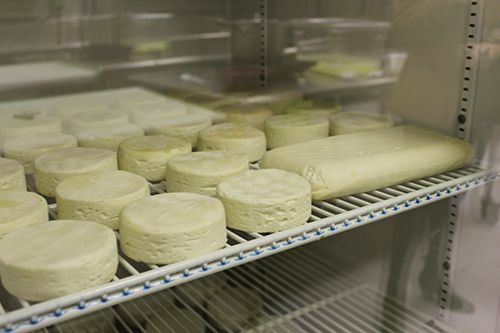 First year Culinary Arts students now take a course in the fundamentals of artisinal cheese-making and NAIT is looking towards putting together a one-day hands on cheese class for the general public. This is really exciting stuff! I feel like a lot of people don't pursue the science of making cheese at home because it seems like a daunting task. I used to think so, until I made mozzarella for the first time two years ago. It's easy peasy. As long as you have the proper ingredients and enough time & patience (mozzarella takes about 30 minutes from start to finish), the possibilities are endless. 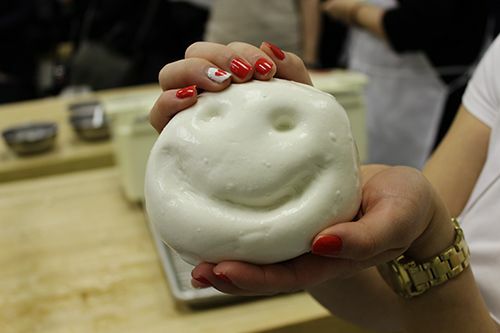 On this particular day, myself along with other media and food bloggers were invited to make a 30 minute mozzarella with Chef Allan Roote, one of the instructors at NAIT. 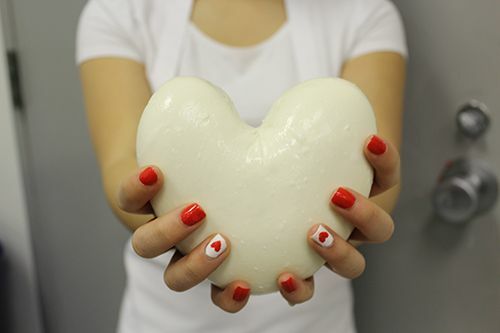 Seeing as it was the day before Valentine's Day, I got a little goofy and made a heart shaped cheese for you all (awwww). To make your own mozzarella is simple, just gather the ingredients and follow the instructions below! 1. Crush ¼ tablet of rennet and dissolve in ¼ cup of cool non-chlorinated water and set aside to use later. 2. Add 1½ tsp) of powdered citric acid to 1 cup cool non-chlorinated water. Stir to dissolve. 3. Quickly pour cold milk and citric acid into a pot so they are well mixed. Next, slowly heat this mixture to 32'C/90'F - this should take about 10 minutes. Stir gently and slowly and do not touch the sides or bottom of the pot. 4. At 32'C/90'F, remove the pot from the burner and slowly add the dissolved rennet to the milk and stir in a top-to-bottom motion for approximately 30 seconds. Cover the pot and leave undisturbed for 5 minutes. 5. Check for a clean break in the curd by slicing and lifting the 'cheese'. If too soft or the whey is milky, let set for a few more minutes. 6. Cut the curd into a 1" checkerboard pattern. If a drier cheese is desired, carefully cut into smaller curd sizes and gently stir to release more whey. 7. Place the pot back on the stove and heat to 40'C/105'F while slowly stirring the curds with your hands, using a gentle lifting motion. 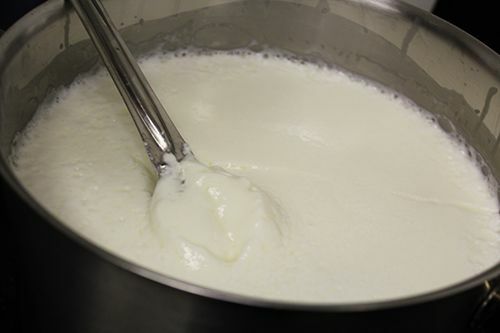 Once that temperature is reached, take off the burner, cover and let the curd release more whey undisturbed. 8. 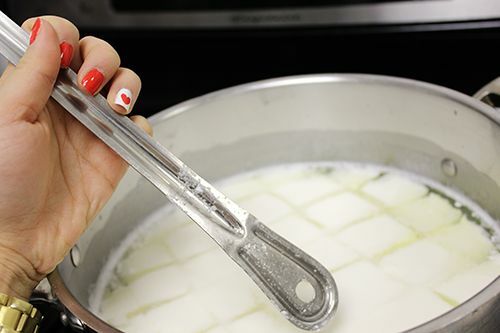 Strain the curds through a mesh strainer or scoop them with a slotted spoon into a microwave-safe bowl. 9. Press this curd gently with your hand, pouring off as much whey as possible. Reserve this whey to use for cooling the mozzarella. 10. Microwave the curd on high for 1 minute. You will notice more whey has run out of the curd. Drain off the whey. Season the cheese to taste with salt. Quickly knead the cheese with a spoon or your hands until it is cool enough to touch (rubber gloves will help – the cheese is almost too hot to touch at this point). 12. Taste it for seasoning and add more salt if necessary. This is where you can add other spices or herbs. 13. At this point the cheese should be soft and pliable enough to stretch like taffy. It is now ready to eat or you can add ice to the reserved whey and cool your cheese in the whey. When cold you can wrap in plastic and it will last for several days, but is best when eaten fresh. So now you must be thinking, where on earth am I going to find citric acid and rennet?! Well, I can start by telling you that citric acid is fairly common. I've picked it up at London Drugs in the pharmacy, and at Bulk Barn. As for the rennet, you can find it in a box at the Italian Centre - but you get a fair amount, so share with your friends! For step by step instructions on how to make your cheese, check out this awesome video demo put together by NAIT. If somehow you're still not convinced that you can do it yourself at home, keep an eye out for the class that NAIT will be putting together in the near future! 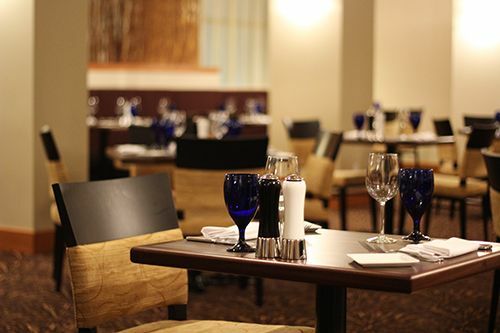 When you go on vacation do you typically dine at the restaurants featured in your hotel? I will admit that 90% of the time I do not - unless that restaurant happens to be on the itinerary of the culinary portion of my trip. Furthermore, how often do people actually seek out visiting a restaurant that is inside of a hotel? After undergoing extensive renovations and rebranding, the old Mayfield Inn & Suites has transformed into Edmonton's first Doubletree by Hilton. When it came to my attention that the hotel chain was coming to Edmonton all I could think about was the warm chocolate chip cookies that they are known for. But cookies aside, I was invited to check out the property and have a tasting of the menu at Stages Kitchen & Bar, the new restaurant that has taken the former location of Vic's Steakhouse. The culinary vision behind Stages Kitchen & Bar is lead by Executive Chef Willie White (formerly of River House Grill in St. Albert). With an extensive background in culinary hospitality, Chef White is bringing his passion for local and regional produce to the menu. It's not very often that you see hotel restaurants actively supporting local producers, but I personally think that is the direction that many establishments need to head towards in order to be successful. In an effort to showcase the farm-to-table philosophy, a handful of the producers that are partnered with Stages receive recognition on the menu. Alberta Bison Ranch, Sunworks Organic Farms, Sylvan Star Cheese and Mighty Trio Organics are just a few of those mentioned. 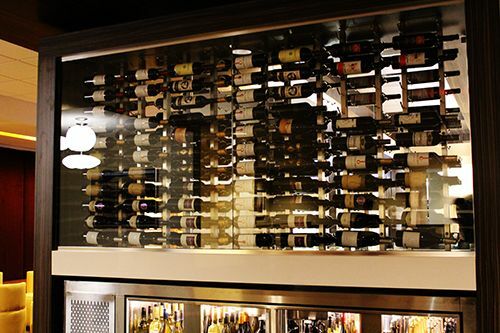 But what's even more impressive is that approximately 70% of wines available on the wine menu are made in Canada. It's a great sight to see and I love knowing that travellers will get exposure to all that Canada has to offer. 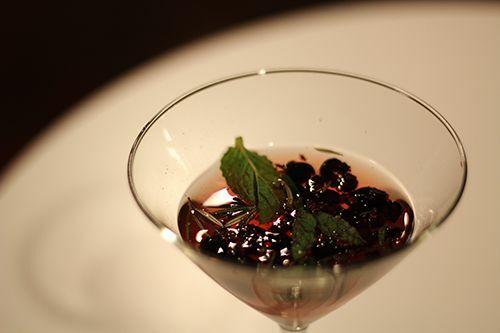 Before we were introduced to any food all the guests at the tasting were invited to try out their signature martini, made with Victoria Gin, saskatoon berries, muddled mint & fresh rosemary. The management team presented the yet-to-be-named martini and hoped that someone would be able to come up with the perfect name for it. I called it "The Valley Affair," pulling inspiration from the beautiful river valley here in the city. And to my surprise that's the name that has been chosen for it. Pretty neat! The martini was light and refreshing, and my only wish would be for the mint and rosemary to be infused into the drink. 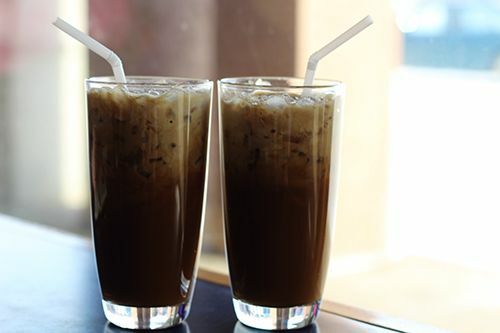 It would enhance the "drinkability,",making it smoother and decrease the likelihood of drinking a salad of herbs. On this particular evening Chef White wanted to showcase a variety of dishes available on the dinner menu. We started off with their thin crust pizzas, which are made in house in a pizza oven (not wood fired). The high heat and the use of a pizza stone allows all the pizzas to be cooked within 3 minutes, and I was quite impressed with how the pizza turned out. 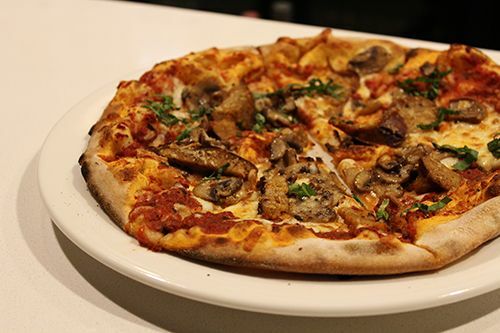 First up was the Sunworks Organic Chicken Pepperoni & Mushroom pizza ($14) which was packed full of flavour and a kick of heat. What I do like best about the pizzas though is the crust. The crust is thin, crisp, and keeps its structure. There's nothing I dislike more than a soggy, flimsy crust. The next pizza I tried was the Jerk Shrimp & Pineapple pizza ($14), which is inspired by Chef White's daughter. This combination is something I've never thought of pairing together, but it worked. 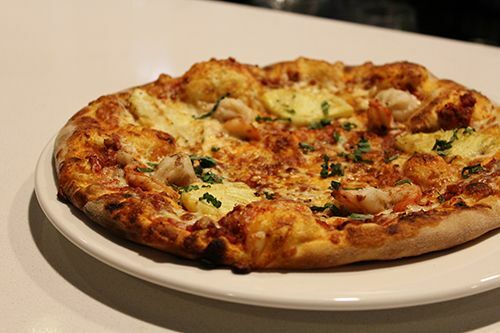 The heat from the shrimp was offset by the sweetness of the pineapple, and when placed on a thin, sturdy crust, I am not one to complain. 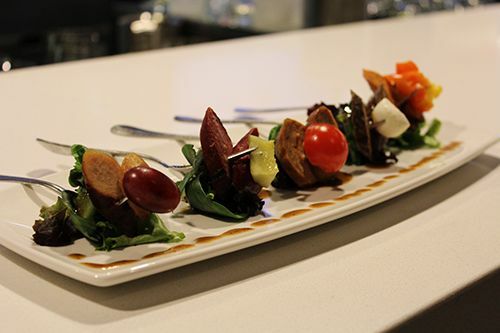 Next we were introduced to the Five Fork Banger ($10) appetizer, which features a selection of local sausages and greens drizzled with balsamic vinegar and olive oil. We were given the elk sausage and bison sausage to try, both of which were lean and mildly seasoned. The elk was paired with a serving of bocconcini while the bison was served with a pickle. Both were nice combinations and the dressing added some moisture and flavour to the one-bite "salad". Our last appetizer was probably my favourite dish for the entire evening. 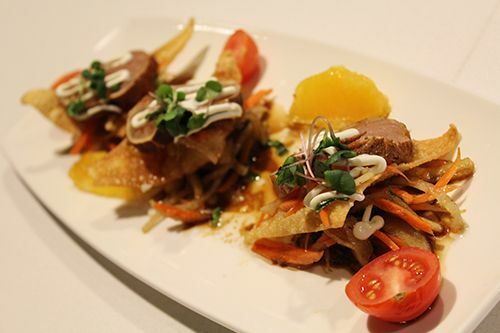 The Tuna Tataki ($13) featured lightly seared blue rare tuna atop a wonton crisp and Asian slaw, and topped with microgreens and creme fraiche. The tuna was buttery smooth, but I loved the slaw in this dish the most. Extra crunchy vegetables are marinated for 5 minutes in a flavour packed dressing with notes of soy, citrus and ginger. I feel like I could sit and just eat the slaw for days. I wanted more when I was done and regretted gobbling it down so quickly! My first entree of the night was the Pan Seared Arctic Char ($28) served with a tomato, ginger and fennel chutney and a side of baby potatoes & vegetables. The fish was perfectly cooked, flaking off with each bite. The seasonings worked well together to flavour the dish and still highlight the natural flavour of the arctic char. 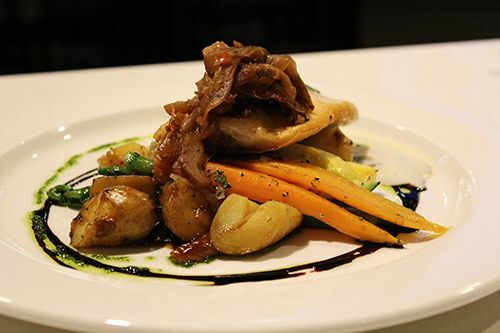 Our next entree was the Seared Prairie Chicken Breast ($21) served with a field mushroom sauce. Chef White mentioned that the sauce was made using a combination of fresh and dried mushrooms to infuse the earthy flavours into the dish. The chicken breast was marinated and cooked nicely, and stayed moist with the help of the peppery sauce. Last but not least was the Local Alberta Bison Ranch Meatloaf ($18) which unfortunately was my least favourite dish of the evening. The meatloaf itself was a simple recipe with spices, egg and bison meat compressed together and cooked. It can be really difficult to bring moisture into a meatloaf made with a protein that is very lean to begin with, so I was hoping that the kitchen team would have been able to overcome producing a dry dish. 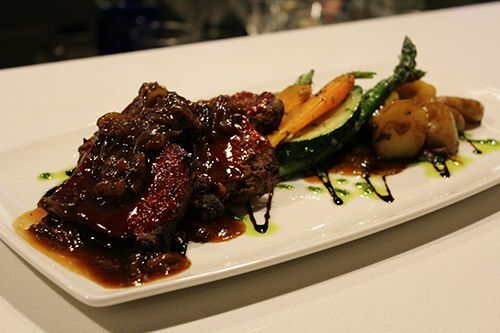 The meatloaf was topped with a sweet caramelized onion and Rickard's Red beer sauce which gave the dish more flavour and moisture, but it wasn't enough for my liking. Surprisingly, I made it through the meal to still have room for dessert, so the kitchen brought out a sampling of three desserts available on the menu. Stages brought in a pastry chef from Dubai so I was curious to see what had been created. 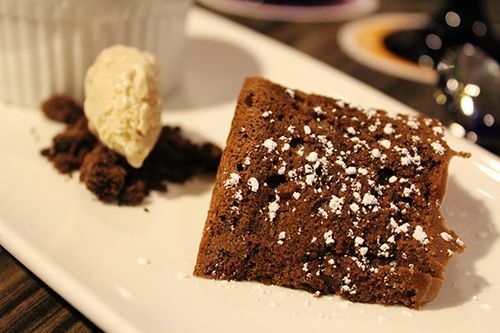 The Dark Chocolate Molten Cake ($8) was accompanied by cappuccino ice cream on a bed of 'salted chocolate earth.' The molten cake was nothing like I imagined - no thick oozing centre, but rather the centre had a smooth mousse-like texture to it. 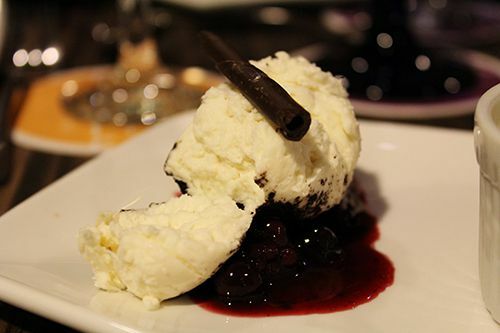 For someone who doesn't normally enjoy the richness of the typical lava cake I would gladly have this version any day. The ice cream on the other hand was rich and creamy with a light sweetness when paired with the salted cookie crumble. 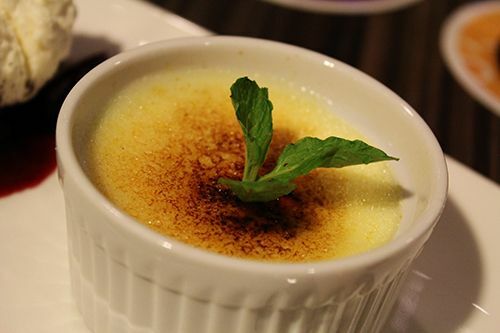 Next on the plate was a Maple Ginger Creme Brulee ($8) which was light and creamy. The maple and ginger were not very noticeable and I would have liked to taste those flavours more. However, the custard was so smooth and had a light sweetness so it was all around a great dessert. Last but not least was the Vanilla Bourbon Cheesecake ($7). Served with a wildberry compote, this dessert was the most interesting for the evening as it featured a 'poached' cheesecake gently coated with a fine cookie crumb. The scoop of cheesecake was light with an interesting texture. I can't really describe it, but if I had to, the cheesecake felt smooth, fluffy, yet dense at the same time. I told you it was hard to explain. All in all I had a wonderful evening at Stages Kitchen & Bar, sharing delicious food with great company. I commend the restaurant for taking the farm-to-table concept to heart, highlighting the work of local producers in Alberta and featuring some of the fantastic wines that can be found in Canada. Although the restaurant is brand new, hospitality is clearly important to both the hotel and restaurant, so the servers work hard to meet every need. I know this was a tasting event, but I do hope that all patrons are able to experience the same level of service and quality food. 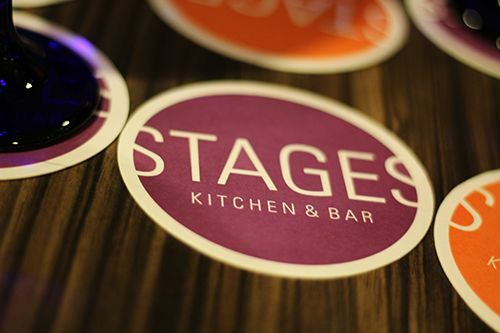 So stop by and check out Stages - and please get the tuna tataki! I will definitely be returning for that... and for the Doubletree chocolate chip cookie. Disclaimer: as this was a media launch event, views expressed in this post are solely mine. I was not expected to feature this restaurant on my blog, nor obligated to do so. This post is 100% my opinion, and as always, my priority is to you, the reader, to present an unbiased, thorough review. Happy Monday! It's been a whirlwind of a week & weekend for me having to deal with post-wisdom teeth woes. Thank goodness that's a once in a lifetime ordeal! I'm not usually one to have themed nails, but when Nail Polish Canada asked me to create a themed manicure, I was up for the challenge. If you love this look, give me a vote here! What makes an outfit extravagant for you? When I think extravagance, I think beautiful, glistening jewels and elegant dresses. When Modcloth asked me to style their Evening of Extravagance dress, I was up for the challenge! 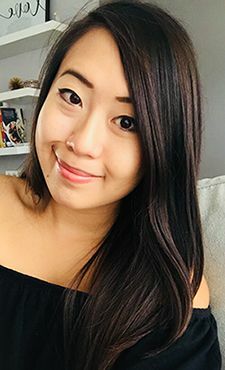 Using only items carried by Modcloth, I styled this outfit for a glamorous night out on the town. I love the lace detailing in this dress and the black and gold shades emanate elegance. The black heels with scalloped detailing pair well with the lace of the dress and don't distract from the rest of the outfit. Add some interest to the neckline with a beautiful necklace, top with some shiny earrings and don't forget to style your hair into a low bun to show off those jewels! Finish it off with a beautiful clutch and this outfit is ready to go for cocktails at a black tie event. How would you style this dress? Sherwood Park isn't always a place I like to venture out to. As I live deep in the south of Edmonton, I'll venture out to the park just for Sumo Sumo's sushi. Mmm. 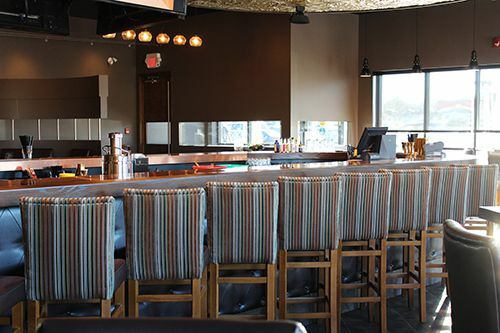 But last month a new restaurant opened up in Sherwood Park that offered "meticulously casual" cuisine in a "contemporary speakeasy" environment. The description was confusing but I was definitely curious to say the least. One of the owners, Marko Mastoras, reached out to me and invited me to their grand opening. I'm not one to give up the opportunity to try out restaurants that support local producers, so I brought my sister along with me for brunch to celebrate her birthday. Square One has taken over the old Rogers Video space and the renovations are beautiful. Big windows allow for lots of natural light to stream into the restaurant to brighten up the space filled with wooden decor. A large bar outfitted with colourful bar stools sits in the middle of the dining room, and what really caught my attention was the beautiful baroque ballroom-esque ceiling over the bar. 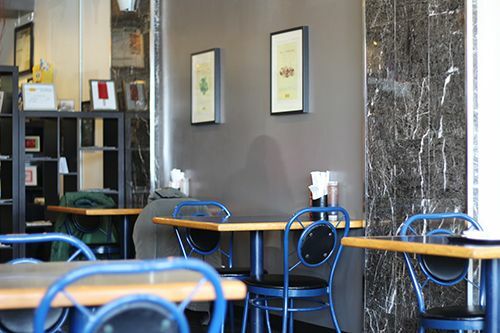 The space is a mix of cosy and casual, but likely has a more upscale feel in the evenings. 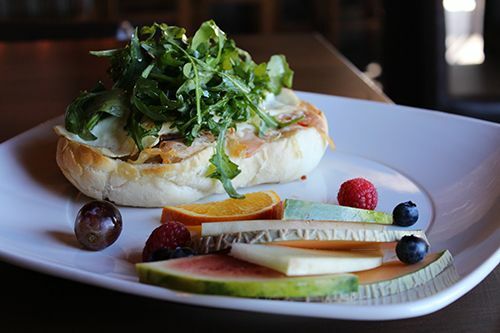 Square One offers their brunch menu on Saturdays and Sundays from 11AM - 2PM so you can sleep in and still catch brunch on those lazy weekend mornings. 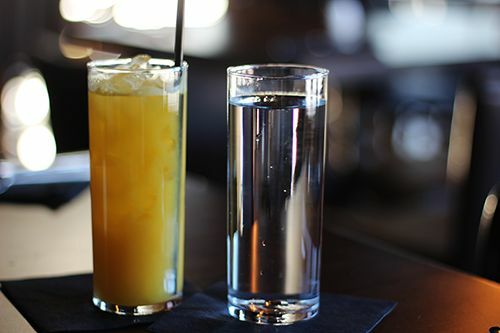 With every brunch they will be offering a freshly squeezed juice depending on seasonal availability. I opted for the freshly squeezed orange juice ($4.50) and it was a nice refreshing start to my day. The menu at Square One is internationally influenced and features flavours from around the globe. This is especially evident in the brunch menu where all the dishes are named after different countries. I chose to go with Italy ($15): open face sandwich, sourdough, prosciutto, arugula, mozzarella, fried eggs, tomatoes. The sandwich was presented beautifully with a side of fresh fruit and I was excited to dig in with my fork & knife. All the ingredients were laid on top of pillow soft sourdough with a crunchy crust. The flavours were well balanced and a nice ooze of egg yolk tied the dish together. 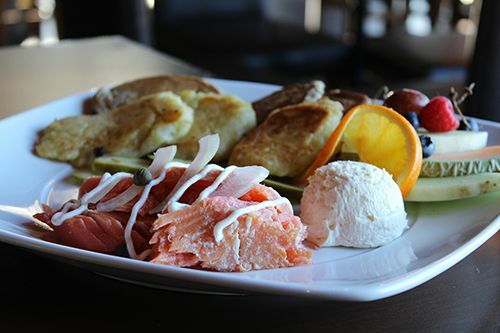 My sister on the other hand ordered Russia ($16): smoked salmon, crème fraiche, cream cheese, onions, pickles, latkes, blinis. When it came to the table I was actually quite surprised to realize that the smoked salmon (along with other charcuterie) is made in house! Square One cures and smokes Lois Lake salmon and I loved that it was served up in chunks. I appreciated the flaky, meaty texture since I cannot stand the sliminess of other varieties at times. It was definitely on the salty side but the flavours were toned down when paired with the latkes and blinis. It was a nice dish all around and definitely filling with the side of fresh fruit. 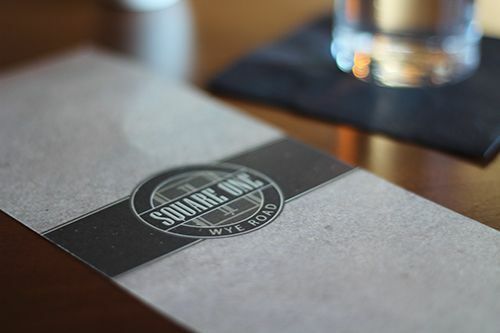 With a primary focus on supporting local, Square One is a nice addition to the culinary scene in Sherwood Park. Lois Lake, Spring Creek Ranch, and Irvings Farm are just a few of the names you can find mentioned on the menu, and it's great to see more restaurants giving recognition to local producers. The dinner menu also offers tons of intriguing options. Butter chicken wings? Gochujang edamame? Calamari with togarashi? Executed well and this could become a favourite for many that live in the area. The dishes do run on the pricier side, but this is generally the trend seen when a restaurant is enthusiastic and willing to support local. Square One features drink specials daily and even has performances during happy hour from time to time. I wouldn't drive all the way out to Sherwood Park just for dinner, but if I were in the area I would definitely consider dropping by to check out some of the more inventive dishes. Check them out if you're in the area and let me know what you think!